After 25 years, this ride will be shutting down at a local theme park. Aftera quarter of a century long of soaking riders at one of San Antonio's theme parks - Six Flags Fiesta Texas. The theme park has announced that they will be closing the "Power Surge" attraction down for good on July 23rd. 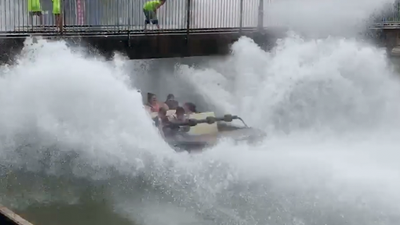 "Power Surge" is a log flume ride that takes riders up a hill in a log shaped boat, around a tight corner and down a double-dipped slope soaking everyone riding and people watching from the bridge. The theme park didn't say what type of attraction would take it's place. Do you have memories of this ride or have you ever rode it before? The ride was also featured in the 1993 movie "Blank Check."